In 1979 I moved to Alamogordo, NM in answer to an inward call that I did not understand at the time. I was drawn to the Educational Impulse we all know as Southwestern College and was a member of the first graduating class. In the first year of my studies it became clear to me that I was to help establish this school as part of my own destiny pattern. I have spent almost thirty years with what we mean by “Consciousness” and I would love to take this opportunity to share what spirit brings to me on that topic for this very special Heartlink. Quantum physics is now demonstrating scientifically what was always ‘known’ in the perennial wisdom traditions. 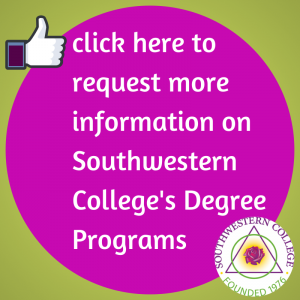 The mission of Southwestern College was originally received in 1976 as a ‘transmission’ by extraordinary people steeped in wisdom traditions. They used their sensitivities to see into what they called ‘the invisible realms.” These realms of consciousness are now being studied in fields such as Noetic Science and are referred to by practitioners of energy medicine and transpersonal psychology. I find that I can’t really teach anybody about consciousness. Even though an intellectual understanding of it can be interesting, it is not the purpose of this college to pursue it in that way. Because consciousness is greater than, albeit inclusive of, the egoic mind we must use other faculties to move into the realms that it encompasses. Reference points such as what it feels like to hold a newborn baby, what happens in us when we witness a heroic deed or the feeling we sometimes tap into in nature can be used to catch a glimpse of states that transcend fear and limitation and hold a sense of timelessness, inspiration and connection. Consciousness can be viewed as a transmission that permeates all senses simultaneously and lifts us into a state of being into which we can’t think ourselves. Students at SWC are immersed in a curriculum that challenges life being lived on automatic…. also known as living in a trance state, Conditioned ways of acting and reacting, attachment to limiting beliefs such as ‘control equals safety’ and entertaining states of contraction such as judgment are brought into the light of consciousness. “Educare” asks for the awakening of inherent wisdom through deep reflection and happens when true connection with Self as Soul is experienced. Our commitment to contribute to life and our courage to ‘show up’ is the fire that shows the way. This kind of education is a living art. It fosters a commitment to, and a reverence for consciousness through being aware of, and taking responsibility for, the impact of our every thought, word and deed. Our times are asking for a great change in consciousness to occur collectively. It is said in many prophesies and is apparent globally. Critical mass builds and there is a revolution afoot which requires the evolution of each one of us in consciousness. If any of this speaks to you……please listen. This college was created for you. You are needed to help in bringing in what has been called the dawning of a New Age.